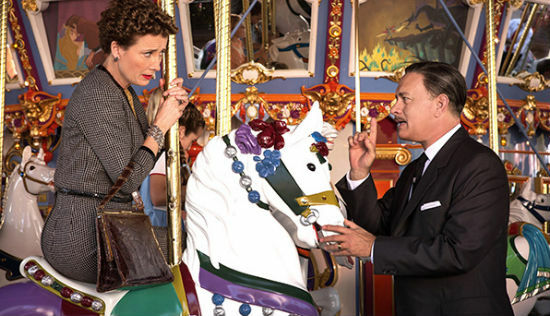 Two-time Academy Award winner Emma Thompson (Beautiful Creatures) and double Oscar-winner Tom Hanks (Captain Phillips) star in this true story inspired by the astonishing backstory of how Disney’s classic Mary Poppins made it to the big screen. With outstanding performances by Thompson, Hanks, and Collin Farrell (Epic) as Mr. Travers, this incredible tale gives a huge bang for your buck. With eye-popping set design of the 60s, featuring sunny Los Angeles and turn-of-the-century Australia with its Wild West essence − the film is a true winner. Directed by John Lee Hancock of The Blind Side, the film is character driven with emotions running sky-high at times. This is a wonderful family film for most, although smaller children may have trouble comprehending some of the heavy issues of drunkenness and death. All in all, Hancock keeps the emotional reins tight, but loosens them at times with refreshing comic relief. The musical score is at times serene and haunting, while at other times, toe tapping and uplifting. Walt Disney had a promise to keep to his daughters; that he’d make a movie of their favorite book by P.L. Travers: Mary Poppins. Little did he know that it would take him twenty years to make good on it. What he also didn’t fathom was that the author of this endearing novel would be such a resistant participant in the process. Her relentless demands, scowls, and tantrums were enough to cause most to throw in the towel. The film tells two stories simultaneously: We learn of Travers’ difficult childhood in Australia with her alcoholic but loving, sweet, father (Collin Farrell), and her kind, mentally unstable mother (Ruth Wilson). The other story is the clashing of Travers with Walt Disney and his songwriting brothers Richard and Robert Sherman, played by Jason Schwartzman and B.J. Novak, over the elements of the film. From the get-go, Travers insisted on no animation in the film and, at one point, proclaimed there would be no color of red. As most of us know, the park scene in Mary Poppins was groundbreaking with the dancing animated penguins and red is the color of Mary Poppins’ scarf and belt. Paul Giamatti, as Travers’ limo driver, is a standout as he neutralizes her icy demeanor with his kind nature and heart of gold. Other treats are the scenes of Disneyland Theme Park in the 60s, as the recreation is spot on, and it brought back many magical memories of one Southern Californian author (me) who was fortunate enough to enjoy the park with her family while she lived in Los Angeles during her elementary school years. Bottom Line? Heartfelt film with fantastic performances, artist design, and period sets that are breathtaking. Musical score sets the perfect tone. One of the best family films of 2013! Cast: Emma Thompson (P.L. Travers), Tom Hanks (Walt Disney), Colin Farrell (Travers Goff), Ruth Wilson (Margaret Goff), Paul Giamatti (Ralph), Jason Schwartzman (Richard Sherman), and B.J. Novak (Robert Sherman).